Would that make you feel better or worse about this image? 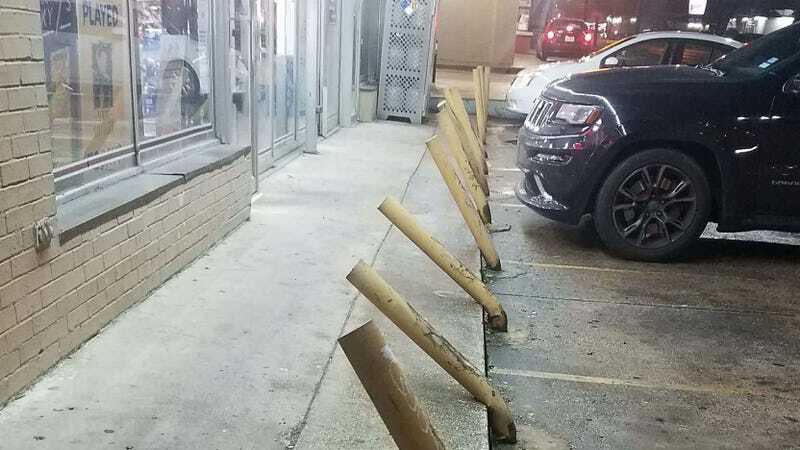 Spotted at a small convenience store in Dallas TX by Imgur user HulkHogansNutSack, these posts are a sobering reminder of the drivers we share our roads with. You’ve probably spotted more than a few parking bollards like this in your own town. It’s not all that unusual too see a randomly damaged post or two, sticking out from an otherwise orderly row like a sore thumb. But this isn’t your average everyday stupid. This is advanced stupid. Rather than a single monument to an embarrassing mistake, we see here bludgeoned bollard after bludgeoned bollard, a testament to what surely must be multiple drivers who don’t seem to care about damaging their car, or about damaging others’ property, and probably couldn’t care less about the dangers of drunk driving, either. Just imagine, if these posts could talk, the stories they’d tell between their screams of agony. They’ve done so much to protect that store, and have borne witness to so many horrors. Let us salute their silent bravery.